Have you seen the new "Game of Thrones" x Urban Decay collab? It's quite dreamy and includes everything from a Daenerys-inspired lip/cheek stain to a Lannister gold eyeliner. 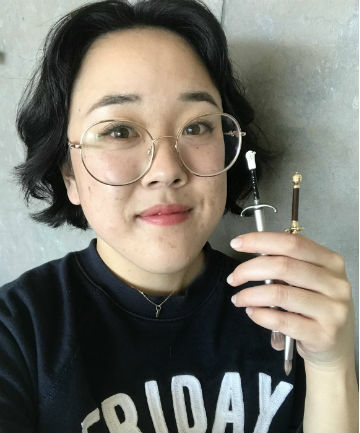 For me, though, the clear stars of the collection are the brushes: There's Jon Snow's Longclaw, $28, a fluffy eyeshadow brush and Arya Stark's Needle, $28, a flat eyeshadow brush (appropriately) designed for precision work. Each brush has a satisfying heft to it and the attention to detail is glorious: Longclaw features a white direwolf on the pommel, complete with ruby red eyes, while Needle has a delicate gold handguard. In other words, they look like you grabbed them straight out of your TV screen. Ever had a beauty product you love so much that you shook, hacked, scraped or squeezed its container until you were absolutely positive you had expended all of its precious contents? Rare indeed is the product that elicits that deliciously desperate feeling, especially in beauty editors. So when our team of beauty mavens encounters a rave-worthy product, you know it's the real deal. Herewith, our editors rattle off their "beauty empties," aka the best beauty products that they can't help but use until the last drop. Read on for their best nail polishes, hair products, skin care products and makeup now.